Microgaming’s Mega Moolah is one of the longest running progressive jackpot slots on the Internet, retaining a simplistic but captivating design. Boasting four accumulative jackpots within the bonus round, this title is the hallmark of the Microgaming Progressive Jackpot Network (MPJN – Microgaming’s network of interconnected accumulative jackpot slots via the Web), utilising the foundation jackpot format which other Microgaming slots incorporate, such as Mega Moolah Isis. 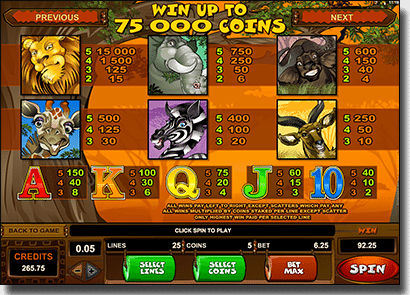 The Mega Moolah game itself owns a wild African, Safari theme, with the calming sounds of jungle animals heard in the background. The graphics are not extraordinary, but the simplistic nature of the game is what makes it so appealing. The game’s symbols are listed below. Spin two or more of these symbols across any active payline, and you win the following amount of coins, multiplied by your initial coin bet size per line. Note: The Lion, Monkey, Elephant and Buffalo pay out according to two, three, four and five matching symbols across any active payline, while all the other icons pay out according to three, four and five matching icons. The wild icon will substitute for all other symbols (except the scatter icon) in order to complete a winning payline. It will also double your win. You earn 15 free spins if you manage to spin three, four or five scatter icons, anywhere across the reels, during the regular game. Free spins can be re-triggered if another three, four or five scatter icons appear during free spin mode. All winnings are tripled during free spin mode. The bonus round is triggered randomly. When triggered, you are taken to a Wheel of Fortune style bonus game, and allowed to spin the bonus wheel. The wheel boasts 20 pockets, with 10 pockets reserved for the mini bonus, six pockets reserved for the minor, three pockets reserved for the major, and one pocket reserved for the mega bonus. You will be awarded the current accumulative prize at the time of whichever pocket you land on. All jackpots are displayed within the game, and each resets to its base level once hit. Mega Moolah is only available to play in real money mode. Mega Moolah is available across all platforms, including desktop, laptop, tablet, mobile and even Smart TV, for instant-play with no downloads necessary. Sign up at Jackpot City Casino, make the most of the new player matched deposit bonus (up to $1,600), and start spinning the Mega Moolah reels for the chance to become an instant millionaire.